Until last year, I had never tried to make quick-preserved lemons or pickles or anything that isn’t eaten immediately then I started learning more and more about cooking from Chefess Kate. She encouraged me with her easy yet traditional approach to escorting fresh Irish ingredients from earth to eating. Everything I know about cooking, I’ve learned from my mother, my honorary aunt Pascale and Chefess Kate. This recipe is one that Kate encouraged me to develop. 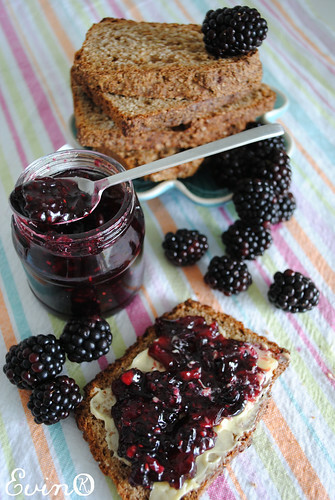 She makes her own homemade raspberry jam for her restaurant to serve with her fresh-baked Fenn’s Quay scones. I made it using blackberries from the very scenic region of Ireland known as West Cork and apples from a friend’s tree. But rest assured, I’ve also made it with store-bought apples and frozen blackberries so it works equally well either way. I am delighted to tell you that this recipe was included in Goodall’s A Modern Irish Cookbook! 1. Preheat the oven to 180oC. 2. Place the berries, apples and lemon juice in a pot over a low heat. Once they begin to warm up, add in the sugar, stirring until it’s dissolved. Cook for a further 30 minutes on the lowest heat possible. 3. Spoon into sterilized jam jars and let it cool slightly before securing the lids. 4. 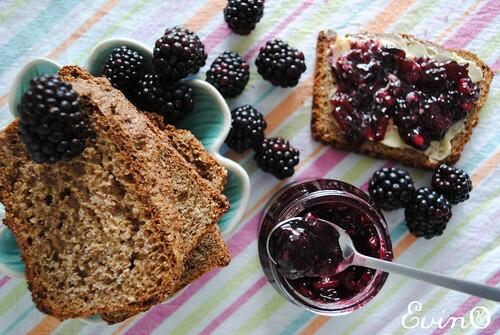 Because this quick jam has no preservatives, it should be kept in the refrigerator or a very cool, dry place and enjoyed within 2 weeks of preparation. Serving Suggestion: Serve with butter on fresh bread or toast or add a dollop to morning porridge to liven it up a bit.This is also lovely blended with chopped jalapeños and served atop baked brie (here’s my recipe for Baked Brie en Croute with Spicy Blackberry Preserves). This recipe was featured in Goodall’s A Modern Irish Cookbook (2012). This entry was posted in Breakfast | Brunch, Photography, Recipes and tagged Baking, food styling, goodall's, how to.